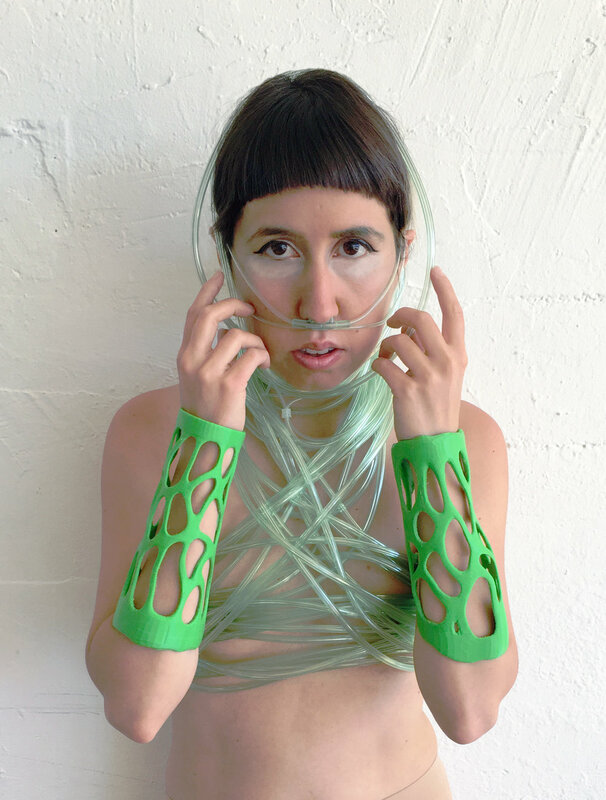 Cyanosymbionts (2018, ongoing) is a series of images, garments, prosthetics, and art objects for installation and short film that speculates on potential symbiosis of cyanobacteria with humans and other multi-species entanglements during this time on our changing planet. This project is based on research of other species that are symbiotic with different strains of cyanobacteria and green alga - such as green sea slugs, spotted salamander embryos, sloths, the roots of cycads, and others. This project is also inspired by recent research done around genetically engineering photosynthetic bacteria to exist in the cytoplasm of mammalian cells. Cyanosymbionts focuses on the global environmental phenomenon of harmful algae blooms and the proliferation of cyanobacteria blooms due to human pollutants. Cyanobacteria are ancient organisms that were the first to create oxygen on the planet through photosynthesis. Later through endosymbiosis, they also became the chloroplasts that exist in all plants today, as well as enabling all oxygen dependent life on our planet. Cyanosymbionts considers our relationship to our environment and our increasingly biotechnological landscape, gene-editing, synthetic biology, and bioethics. With these garments and through images and installation I want to explore these entanglements of humans and cyanobacteria, and in addition, shift perspectives of humans as single entities to symbiotic entities. Through this series I want to explore both the micro and macro scales of life within the body and on the planet. Bacteria are often seen as simple, but they are complex systems in membrane-bound spheres. Cyanosymbionts looks toward bacteria as our ancestral life while also remembering the bacteria that exist inside of us as our microbiome - those which comprise 90% of our body. Agapakis, Christina M., et al. “Towards a Synthetic Chloroplast.” PLoS ONE, vol. 6, no. 4, 2011, doi:10.1371/journal.pone.0018877. “Beautiful Monsters: Terra in the Cyanocene.” Arts of Living on a Damaged Planet, Dorian Sagan, edited by Anna Lowenhaupt Tsing et al., University of Minnesota Press, 2017.